There is a dearth of good advice and mentoring available to new managing partners. It is staggering to think that corporate CEO's and other C-level people in the corporate world train their entire careers in order to be prepared when it is their turns to take the helm, but law firms put people at the helm of an enterprise whose revenue numbers have two commas in them with little or no formal training and almost no mentoring. New firm leaders often face challenges that require a mix of luck, skill and the support of experienced peers to guide their efforts. The LAB has been formed to address and inform the burning issues at the top of the managing partner agenda . . . issues like strategy, governance, performance, and profitability. We launch this initiative in tandem with a small group of highly distinguished and long-serving law firm leaders, all of whom have been recognized for their contributions to advancing and leading their own firms. Whether you are new to the role of law firm leadership, are aspiring to spend more time or simply trying to be more effective in your role, we want to hear from you. You may pose your questions, challenges, or issues to tap the collective expertise of the LAB. Your inquiry will be circulated to all members of the LAB, asking for individual guidance, views, and examples. Your inquiries to The LAB will be directed to Patrick McKenna and Brian Burke to coordinate an appropriate answer. These Board co-Chairs will gather and synthesize the group's feedback, and draft a cogent response to the individual presenting the inquiry. will be made known to the board members or the public. The LAB is pleased to announce that it has arranged with Thomson Reuters to have it's counsel published in a new book entitled Serving At The Pleasure of My Partners: Advice To The NEW Firm Leader released in July 2011 - with all royalties being donated to the Children's Make-A-Wish Foundation. The power of this book is that it does something rare - building it's focused content around the real-world questions that its target audience has, and addressing them with the practical wisdom of those who have been there before. 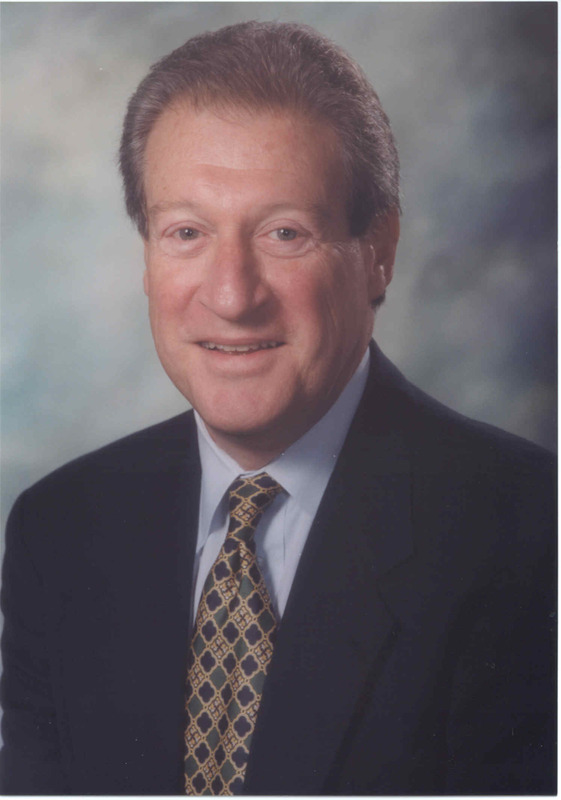 David H. Maister, author of Managing The Professional Service Firm. No research exists to help new managing partners understand how they can become more effective faster, so, in some ways, anything that points them in the right direction would help. But this book isn't anything! It is an outstanding description of the issues that new managing partners face together with a practical set of actions that, when followed, will truly make a difference to how any managing partner is 'seen' by their partners and how they feel about themselves - not to mention the discernible impact they will have made in those critical starting weeks. There's absolutely no doubt that every managing partner I know would have benefited hugely from Patrick, Brian and their colleagues' expertise and I know all of the partners about to take on the mantle or thinking of doing so, will be so much wiser from having read this book. I can add no stronger accolade than I wish I'd written it myself!! Robert J. Lees, consultant to leaders of professional service firms and co-author of When Professionals Have To Lead. 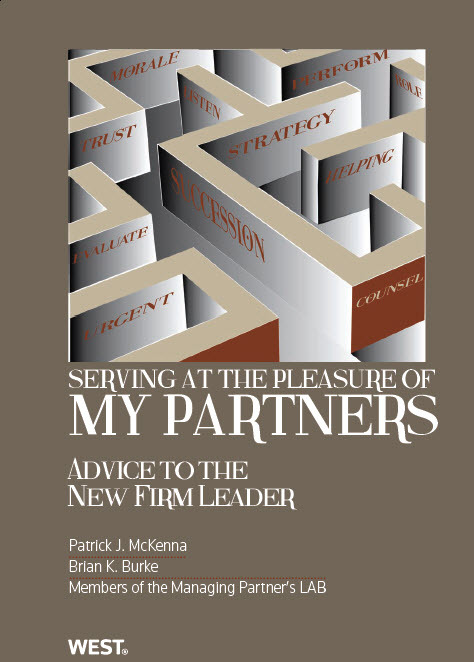 Whether you are charged with leading an accounting, legal, consulting or any professional service firm, Serving At The Pleasure of My Partners is a down-to-earth and practical guide for the new or current managing partner. While nothing can totally prepare any new managing partner for the challenges they will face, this book will be a trusted guide for finding your way down untraveled paths. August J. Aquila, CEO, AQUILA Global Advisors, co-author of Client at the Core: Marketing and Managing Today's Professional Services Firm and selected by Accounting Today as one of the top 100 most influential people in the accounting profession. New managing partners are faced with learning an essentially new occupation - with limited practical resources at hand and few people they can comfortably turn to for advice and counsel. The questions are many and the direct answers are hard to obtain. Serving At The Pleasure Of My Partners provides an instantly useable remedy via the most common, difficult questions that new managing partners have and the informed answers that McKenna and Burke have pulled together and synthesized from the collective thoughts, counsel and advice of those who have "been there, done that." This work is highly readable, filled with practical and actual - not theoretical - answers. John Michalik, Executive Director Emeritus, Association of Legal Administrators and author of The Extraordinary Managing Partner: Reaching the Pinnacle of Law Firm Management. 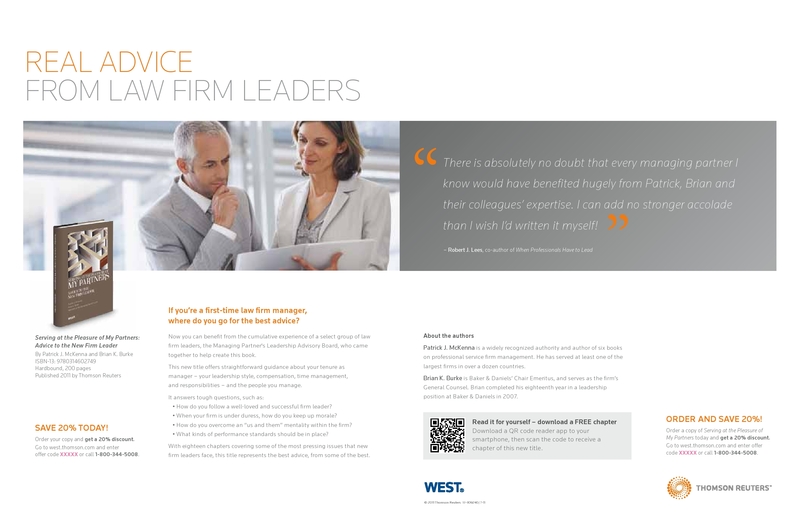 There is little doubt that leadership plays an integral part in law firm performance. This book will be an indispensable resource to new managing partners as it powerfully outlines leadership practice that should help any MP excel. Using a mixture of sage advice and clear examples, these authors cut through the clutter and get right to the heart of the matter. Robert Sawhney, Managing Director SRC Associates (Hong Kong) and author of Developing a Profitable Practice in Asia. Leading a law firm is by no means an easy task. Thank goodness for this group of distinguished authors who have joined forces to provide an invaluable resource for today's firm leader. Serving At The Pleasure of My Partners is packed full of real-life scenarios and provides proven, practical guidance for today's exceptionally busy managing partner. 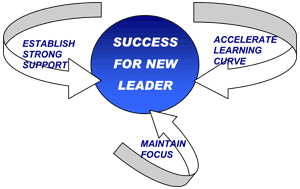 How do you follow a well-loved and successful firm leader? What understanding should the firm reach with its managing partner about compensation and reentry to practice? Are there some techniques for getting a handle on the time needed to properly manage? What is the proper division of responsibilities between a firm chair and a managing partner? Appendix A: Managing Partner Term Limits: What is the Right Answer? What do you do with a group of direct reports, some of whom are performing (or not) in a culture that your predecessor established? How do you get a good grasp of people's views when it seems like the whole firm is conspiring to tell you what you want to hear? What is the leader's role in helping to orientate and integrate new lawyers? What do you do with partners who are in your office every week complaining about something? When your firm is under duress, how do you go about keeping up the morale of your people? How do you assist your senior attorney's transition into retirement? What kinds of performance standards make sense to have in place for shareholders? How might you handle the partner who holds strong beliefs on high-stake topics and demonstrates little willingness to either listen or consider alternative views? Should a firm invest the majority of its time and resources on its core practices? How do you overcome a strong sense of 'us and them' amongst the firm's various offices? As you shift to a practice group configuration, what do we do with office leaders? How do you evaluate and compensate partners for their leadership work - - from the Managing Partner to the Office Managing Partner? What specific metrics should be used to assess the performance of a practice group? When you manage a firm that has been financially successful in the past but is reluctant to confront the challenges of tomorrow, what do you do? Where was this book when I was first coming into leadership and had to attend the school of sink or swim? Serving At The Pleasure of My Partners is a unique and valuable new offering that should benefit any professional charged with leading their peers. Blessed by other management gurus like David Maister (Managing The Professional Service Firm) and Rob Lees (When Professionals Have To Lead) this text contains 18 chapters, representing the more commonly asked questions that any new firm leader struggles with. The book begins with an excellent Forward entitled The Anxieties of Leadership which intelligently addresses critical questions like; the most common mistakes that new leaders make; what makes transitions go wrong and how mishaps could be avoided; and identifies the biggest surprises that new leaders face. The chapters are organized into three sections. Managing Your Tenure addresses how you follow a well-loved leader, techniques for getting a handle on the time needed to properly manage, and concludes with an insightful piece on the pros and cons of having term limits to how long a leader might serve. The second section on Leading People tackles eight different challenges like coping in a culture that your predecessor established; how you deal with a chronic complainer, how you keep morale up, and how you handle boomers approaching retirement. My personal favorite is how you deal with peers who have strong beliefs on high stake topics and demonstrate little willingness to listen. This section concludes with salient advice on how to replace a leader who reports to you, but really is not doing the job. The final section, Leading The Firm embarks upon important issues from how to unite a divided firm with a strong sense of us and them; to how to confront complacency . . . when you manage a group that has been successful in the past but is reluctant to confront the challenges of tomorrow. This section closes with a report drawn from some in-depth research on where new leaders spend their time. This is an extraordinarily useful and practical guide for todays leader. Thanks for your wonderful book. You address -- beautifully -- a major problem, particularly because, unlike corporations, the best qualified manager isn't always the one who gets the job -- but finds him (or her) self in the middle of a morass, without the training or experience. This is for the "now what do I do" moment!